Asian Institute of Technology (AIT) in Thailand would like to invite all interested students and parents to participate in this AIT Day event. 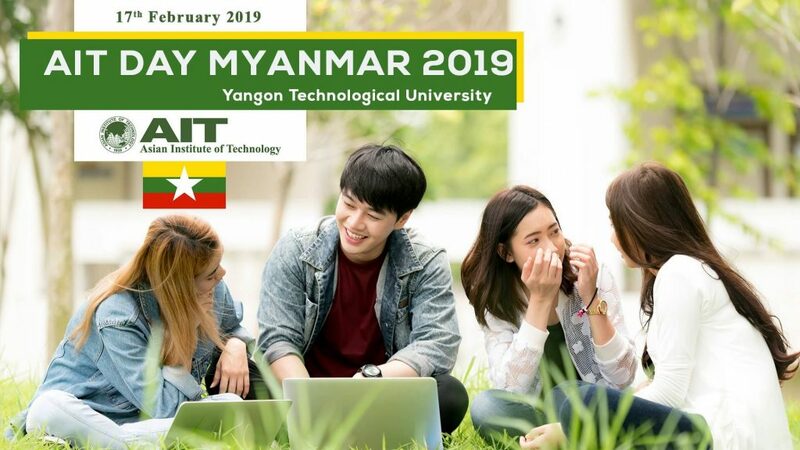 Please come and meet the Dean and Faculty of the School of Environment, Resources and Development and The School of Engineering and Technology, as well as our AIT Alumni from Myanmar and get to know more about AIT. You can also get detailed information about the admission and application procedure, scholarships and other information about AIT. For the convenience of our prospective students, we will also organize an on-site online application filling option and English Test in the afternoon session which you can use to apply in AIT. Kindly fill up the registration form below if you would like to attend this event in the registration form below. Please visit the AIT website and the websites of the three schools to learn more about the Institute.